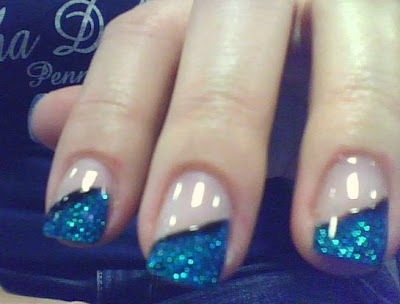 These are the nails that I did on myself right before leaving for the ship. Honestly, not my best work, but in my defense, it was 12am, and i had to get up at 4am for my flight... so not a lot of effort was put in (and also these are probably the worst pictures i've ever taken, but again, it was craptastically early in the morning). I just wanted to make sure that i had the gel extensions on, and that they would last through the 7 1/2 week trip. In my next post I'll be showing you 2 other ways that I've worn this over the last 7 weeks since they've been steadily growing out. Anyway, back to the nails. These are gel nails (meaning there is absolutely no polish used in creating these). The blue glitter triangle was created by drilling out the area, putting down a coat of blue gel paint and curing for two minutes, and then a coat of "peacock" glitter gel and curing for two minutes (both products created by Light Elegance). Then I did a normal fill with LCN's clear gel. I like the LCN forumla best because it's completely permanent (meaning soaking in acetone won't remove it, it must be filed off). Finally i painted a black line with Light Elegance's gel paints, cured, and added a gel top coat. It was my first time working with LE's gel paints, and I wish i had embedded the black line instead of adding it at the end, it ended up being a bit bumpy. Oh well, its a learning process. But anyway, I loved these. They shine in the light! And now 6 weeks later the blue is still just as sparkly as day #1, except for the fact that its grown out like crazy. Check back in a few days for my variations of this! Again, sorry for the horrible pictures!